Traveling should not stop us from exercise. Of course, we are not suggesting travelers to run for a long distance or having heavy exercises. However, adequate amount of exercise in the gym or doing Yoga, enjoying massages or SPA, all these could refresh us from the tiredness during your trip and get prepared for the next day’s exploration. SPA from Banyan Tree is always recommended. 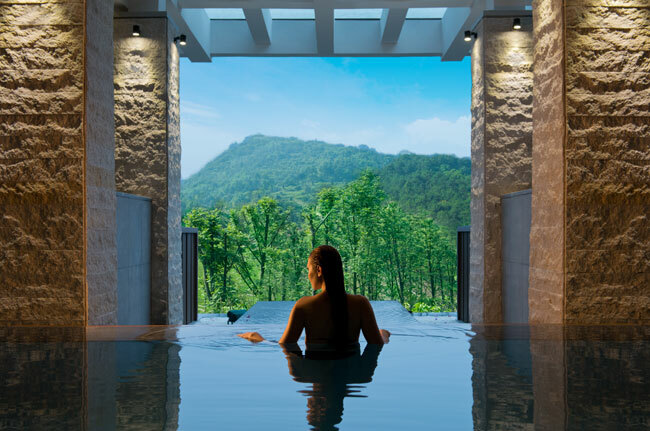 As the first international hotel operator to launch a hot spring resort in Chongqing, Banyan Tree Chongqing Beibei is nestled in the foothills of Jinyun Mountain Natural Reserve and enveloped by an enchanting ambiance of spirituality, tranquility and cultural charm. Banyan Tree Chongqing Beibei offers awe-inspiring views and inspirational experiences. Book a romantic getaway package now and stay before September 29th 2014 starting from RMB 2,999. There’re also Yin Rainmist (RMB 1,900 ++) and Yang Rainmist (RMB 1,900 ++) for you to choose. Visit www.banyantree.com for details.